The late businessman/philanthropist Phillip Schrager spent nearly 40 years collecting art with an emphasis on large scale works to make one of the most recognized collections of contemporary art in the region. This weekend the public is invited to enjoy the nine galleries of work along with the hosts’ executive offices. 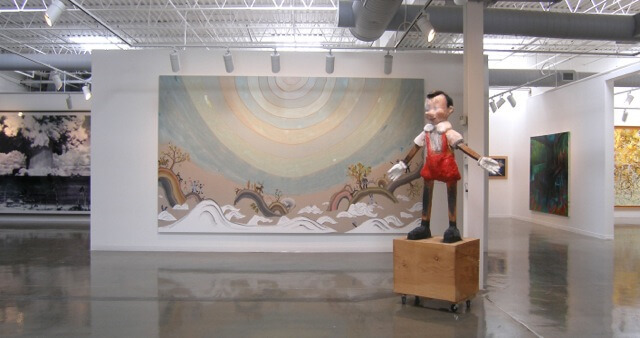 Works include the fascinating sculpture “Bluffs,” with its thousands of buttons by Brooklyn-based artist Tara Donovan, and “The Tender Boy,” paint on carved wood by famed pop artist Jim Dine recalling the charming image of Pinocchio. New on view are “Boot Hill” by New York-based painter Joe Zucker, a sculpture by late UNO alumnus Dan Whetstone, and a painting by New York-based abstract artist David Novros.